The first time I met Claudia Martinez was during rehearsals for the Teatro Luna Theatre festival. She bounded in to the first rehearsal with amused eyes and big smile. What strikes me about Claudia is how hilarious and committed to creativity she is. She drove all the way from Elgin to be part of the rehearsal process and spent a few hours with the other actors rehearsing in room with no air conditioning. 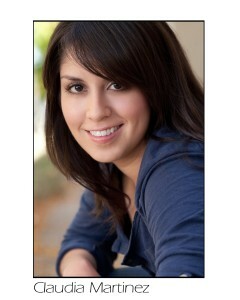 She had been cast to play “La Pata Loca” for my ten-minute play Thirst directed by Nilsa Reyna. At one point, she waved the script at me and asked me if she could take liberties with the script. I smiled and said yes because I knew she could deliver. I’m really excited that Claudia will be part of this month’s Proyecto Latina reading series! You will be in for a treat I promise. Claudia will be performing a compilation of what makes up her comedic DNA. A bit of sketch, improv and stand up. Whether it’s her love of fake mustaches, a good heart felt scene, or plain silly comedy, you’ll see her tackle all that makes her: man, woman, mexican, passionate and a scrappy fighter Christina Aguilera style. Come and connect with Latinas in the arts and beyond! Remember to get there early and sign up for the open mic and bring your chismes for the chisme box. We’d love it if you can spread the word about this event by tweeting it/posting it on your FB wall/ blogging about it or simply telling your comadres to swing by. We greatly appreciate it! Claudia is incredibly lucky to be doing what she loves: writing and performing comedy! She hopes to get paid well doing it so her parents can stop fielding odd jobs for her in their day to day: “Porque no le hablas a tu prima Estela mija? trabaja en el Comcast y dice que estan ocupando gente.” Gimme time A-Pa.
You can also see her around town doing improv and sketch with groups like MARIA, Williams & Martinez, Rascalitas, Hey, Rocket!, and doing Solo-sketch and Stand-up open mics. She has performed at i.O.,The Playground Theater, Chicago Dramatists, Chicago Center for the Performing Arts, DC Comedy Festival, Chicago Sketchfest ’08-’11, New York’s Del Close Marathon at UCB, and Victory Garden Theater’s Ignition Festival. From her heart to yours: Laugh! and keep her there.